••• Strategic Metal Investments Ltd.
Tellurium is a heavy and rare minor metal that is used in steel alloys and as a light-sensitive semiconductor in solar cell technology. Tellurium is actually a metalloid. Metalloids, or semi-metals, are elements that possess both properties of metals and non-metals. Pure tellurium is silver in color, brittle and slightly toxic. Ingestion can lead to drowsiness as well as digestive tract and central nervous system problems. Tellurium poisoning is identified by the potent garlic-like odor that it causes in victims. The metalloid is a semiconductor that shows greater conductivity when exposed to light and depending on its atomic alignment. Naturally occurring tellurium is more rare than gold, and as difficult to find in the earth's crust as any platinum group metal (PGM), but due to its existence within extractable copper ore bodies and its limited number of end-uses tellurium's price is much lower than any precious metal. Although unaware of his discovery, Franz-Joseph Mueller von Reichenstein studied and described tellurium, which he initially believed was antimony, while studying gold samples from Transylvania in 1782. Twenty years later, the German chemist Martin Heinrich Klaproth isolated tellurium, naming it tellus, Latin for 'earth'. Tellurium's ability to form compounds with gold - a property that is unique to the metalloid - led to its role in Western Australia's 19th-century gold rush. Calaverite, a compound of tellurium and gold, was misidentified as a value-less 'fool's gold' for a number of years at the beginning of the rush, leading to its disposal and use in filling potholes. Once it was realized that gold could - in fact, quite easily - be extracted from the compound, prospectors were literally digging up the streets in Kalgoorlie to get disposed of calaverite. Columbia, Colorado changed its name to Telluride in 1887 after the discovery of gold in ores in the area. Ironically, the gold ores were not calaverite or any other tellurium-containing compound. Commercial applications for tellurium, however, were not developed for almost another full century. 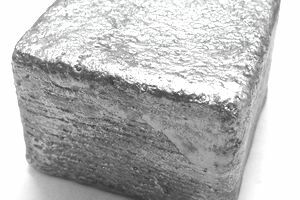 During the 1960s bismuth-telluride, a thermoelectric, semiconductive compound, began to be used in refrigeration units. And, at about the same time, tellurium also began to be used as a metallurgical additive in steels and metal alloys. Research into cadmium-telluride (CdTe) photovoltaic cells (PVCs), which dates back to the 1950s, began to make commercial headway during the 1990s. Increasing demand for the elements, resulting from investment in alternative energy technologies after 2000 has led to some concern about the limited availability of the element. Anode sludge, collected during electrolytic copper refining, is the principal source of tellurium, which is only produced as a by-product of copper and base metals. Other sources can include flue dusts and gases produced during lead, bismuth, gold, nickel and platinum smelting. Such anode sludges, which contain both selenides (a major source of selenium) and tellurides, often have a tellurium content of more than 5% and can be roasted with sodium carbonate at 932°F (500°C) to convert the Telluride to sodium tellurite. Using water, tellurites are then leached from the remaining material and converted to tellurium dioxide (TeO2). Tellurium dioxide is reduced as a metal by reacting the oxide with sulfur dioxide in sulfuric acid. The metal can then be purified using electrolysis. Reliable statistics on tellurium production are difficult to come by, but global refinery production is estimated to be in the area of 600 metric tonnes annually. The largest producing countries include the USA, Japan, and Russia. Peru was a large tellurium producer until the closure of the La Oroya mine and metallurgical facility in 2009. Tellurium recycling is still very limited due to its use in dissipative applications (i.e. those that cannot be effectively or economically collected and processed). The principal end-use for tellurium, accounting for as much as half of all tellurium produced annually, is in steel and iron alloys where it increases machinability. Tellurium, which does not reduce electrical conductivity, is also alloyed with copper for the same purpose and with lead to improving resistance to fatigue. In chemical applications, tellurium is used as a vulcanizing agent and accelerator in rubber production, as well as a catalyst in synthetic fiber production and oil refining.